Did Google Launch A New AMP Testing Tool? Google announced that they launched a new testing tool for AMP (accelerated mobile pages). This new tool is available within Google Search Engine Console or on the test page. The tool works on your mobile device and uses the “live web-search infrastructure” to analyze the AMP page with a real GoogleBot. What this does is give you results in real time. 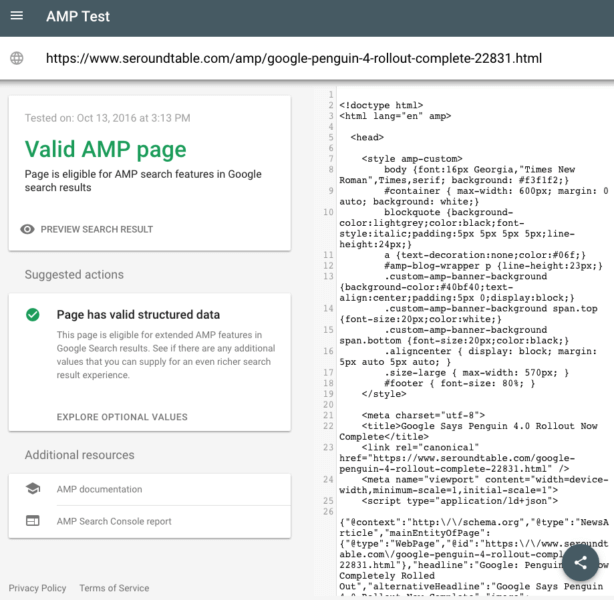 The tool tests the validity of the AMP page as well as the structured data on the page related to AMP. The neat part of this validity tool is that if there are any issues, then you can click on the issues to see the problem. This tool is very specific and will highlight the exact string of code that is incorrect so you know exactly what to fix. This AMP tool also has several links to show you a preview of what your accelerated mobile page will look like in search results. Below is a screenshot of what the test tool looks like in action.